Party Barn Boat & RV Storage understands the need for a stand alone Boat & RV facility. We are located within 3 miles of both Lake Lavon and Lake Ray Hubbard. 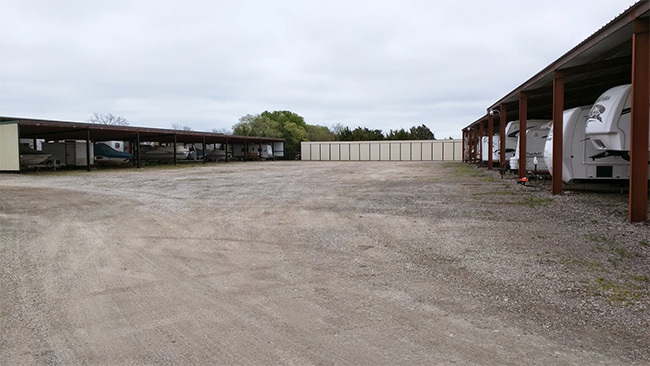 We have over 5 acres of storage on a 12 inch crushed asphalt surface. We have covered, enclosed and uncovered storage. We even have covered with electrical hook up. You will also never need to get out of your vehicle to open the gate. You will have your own 4 digit ID which will open and close the gate. If your looking for a Boat & RV storage that gives you extra room to maneuver while still having low rates you found it. Contact Party Barn Boat & RV Storage today!